If you remember the Hugo cartoon franchise popular in the 90’s, you’ll love the fact Play’n Go has just released a pokies game based on the lovable Scandinavian troll and all the familiar characters from the Troll Forest. Hugo is a fun, animated slot game with a light hearted edge, with cartoon style bonus features conjuring up all the nostalgia of watching the Hugo TV show. Find out how and where to play the pokies with everyone’s favourite friendly troll. 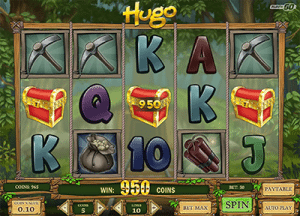 Hugo is a five reel, three row pokies game with 10 paylines. Paylines aren’t fixed, so you can play as little as one line or as many as 10 lines per spin. Coin sizes range from one to five, with coin values ranging from $0.01 to $2.00. Therefore, you can play Hugo for a minimum bet of $0.01 or maximum bet of $100.00 per spin – just use the arrows along the bottom of the reels to select the amount of your wager. While Hugo can be sampled for free at any of our recommended casinos, you’ll need to sign up for an account with a casino in order to play for real money. All of our recommended casinos accept deposits in a range of trusted payment methods. Sign up via our links to claim some exclusive welcome bonuses and start playing Hugo for real money bets. Wild symbol – Hugo acts as the games wild symbol, which is also the games highest paying symbol. An appearance of the wild symbol doubles all wins and substitutes for all other symbols to form a winning combination, except for the scatter and bonus symbol. Free spins – free spins are triggered by an appearance of three or more scatter symbols, which is the villain Scylla (the dark haired woman). Once triggered, you’ll get to play a mini-round to select the number of free spins you’re awarded. Free spins can be re-triggered. Bonus game – Hugo has an awesome bonus game, which is triggered by an appearance of three treasure chest symbols anywhere across the reels and has the potential to earn you up to 500X your total bet. 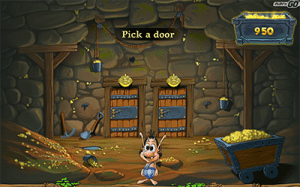 During this bonus game you’ll be taken to a new gold mine screen displaying three wooden doors. Select a door, which will either be filled with treasure and award a win, or Don Croco will be hiding there waiting to kick you out and end the bonus round. If you make it through a golden door, you’ll move to the next level and get to choose again for your chance to win even more. The bonus ends when either Don Croco shows up or you successfully make it through the final door. The Play’n Go brand is widely respected in the online gaming community and as such you’ll find Play’n Go pokies, including Hugo, at several of the best casinos on the Web, including those recommended in our casino table above. Play’n Go uses browser-based software, so Hugo is available for instant-play directly over your Web browser with no downloads required. If you’re looking for a dependable online casino offering plenty of safe deposit options to play Hugo for real money, the trustworthy, stringently tested casinos in our table above get our top pick. Sign up for a new account using our links and you’ll be eligible for some exclusive welcome bonuses like matched deposits and free spins. 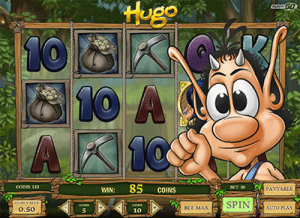 Whether you’re familiar with the original cartoon or not, Hugo is a fun pokies game for those who like their slots on the light-hearted side. It’s colourful, it’s uncomplicated and the bonus features are excellent. While we could do without Hugo coming out to tap on the screen and ask “Helllooo? Is anybody there?” every couple of minutes, we were very pleased with this game and recommend it to all players looking for an upbeat game with some unique ways to win. For more great online slot games, check out our list of online slot reviews.